Hawaiian Airlines has launched its freighter operation with flights between Honolulu’s Daniel K. Inouye International Airport (HNL), Līhu‘e Airport (LIH) and Hilo International Airport utilising two ATR-72 aircraft. The operation, which it was hoped would have been underway by March, started on August 13 with a flight carrying humanitarian shipments to support disaster relief projects in Hanalei on Kaua‘i and Puna on the Island of Hawai‘i. The airline has so far taken delivery of two ATR-72s, with another two due to be delivered, which will allow it to expand its network to include flights between HNL, Kahului Airport (OGG) and Kona International Airport (KOA). Hawaiian’s ATR-72s can accommodate up to seven LD-3 containers, the same type carried by aircraft flying Hawaiian’s transpacific routes, allowing the airline to more easily transfer cargo between the islands and destinations in Asia, the South Pacific and the US mainland. 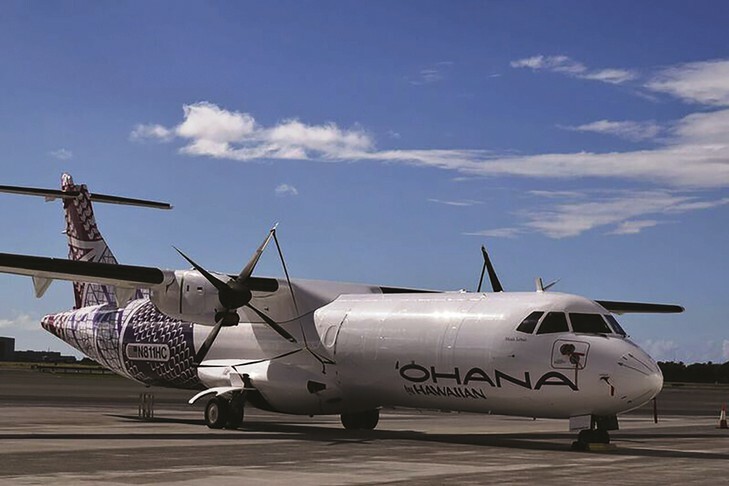 The cargo fleet is branded ‘Ohana by Hawaiian and operated by Empire Airlines, which also operates ‘Ohana by Hawaiian’s four 48-passenger ATR-42 fleet serving the communities of Kapalua (Maui), Moloka‘i and Lāna‘i. “The ATR-72s enable us to meet the cargo needs of our customers and businesses while streamlining and growing our shipping operations throughout Hawai‘i and beyond,” said Peter Ingram, president and chief executive of Hawaiian Airlines. “We are excited to offer our customers a ‘one-stop-shop’ for all their cargo needs,” said Brad Matheny, managing director of cargo services at Hawaiian Airlines. The new ATR-72 service will complement the airline’s bulk freight and containerised shipping Hawaiian provides on over 70 scheduled transpacific daily flights with Airbus A330 and A321neo, and Boeing 767 aircraft. The airline’s Boeing 717 fleet, which flies approximately 170 daily flights between the Neighbor Islands, will continue to provide express shipments throughout the state. The first flight saw Hawaiian’s new ATR-72 aircraft loaded with 1,020 pounds of construction tools bound for Līhu‘e to be used by Kaua‘i Habitat for Humanity in repairing homes for low-income residents affected by last April’s devastating storms. A second flight to Hilo carried 1,815 pounds of furniture for 20 micro-houses built by HOPE Services Hawai‘i to shelter families affected by the ongoing Kīlauea volcano lava flow.